Derry City's team which started against Finn Harps last Friday had an average age of 22. 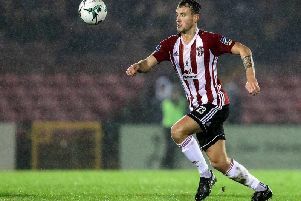 The average age of the Derry team which started against Finn Harps on Friday night, including 27 year-olds Barry McNamee and Ciaran Coll, was 22 - an incredible stat given the manner in which they battled to a 3-2 victory. Devine has been delighted with how his exciting young attacking options have started the campaign and hopes it continues going into the second phase of games, starting at the UCD Bowl. At 19 years of age, David Parkhouse leads the club's scoring charts with four goals - the first of which came against UCD on the opening night of the season. The City boss also believes he's just 'scratching the surface' with 22 year-old Junior Ogedi-Uzokwe, on loan from Colchester United while Eoghan Stokes (22), Aidy Delap (20) and Jamie McDonagh (22) also offer plenty of attacking options. Eoin Toal (20) and Ally Gilchrist (24) have formed an impressive central defensive partnership with Conor McDermott (20) and Patrick McClean (22) playing at right-back and left-back respectively. Nathan Gartside at 20 years of age has proven to be a very capable understudy to Peter Cherrie while youngsters, Ciaron Harkin (23) and Greg Sloggett (22) have been huge hits at the Brandywell club so far. While Devine doesn't expect it to be plain sailing the entire campaign, he's been encouraged by how his young side has gelled together during the early stages of the season as they currently sit in fourth place going into Friday's visit to Belfield. "We don't know where it's going but every week is a bonus with 20 and 21 year-olds, even, 19 year-olds in the squad - it's class. They all know they have to strive to get better but at this moment in time they're a credit. "You look at Junior at 22 years of age he's such an exciting talent and we're only scratching the surface with him. He'll get better and better. You see Greg Sloggett, Ciaron Harkin and Barry McNamee and the effect they're having on games is really top level stuff. "David Parkhouse could play for our U19s in Sligo on Sunday but he's got four goals in seven league games. And to do the amount of work he has done, it's exciting. They've all been brilliant. "Eoghan Stokes is sitting on a good goal tally too and he's an exciting talent. 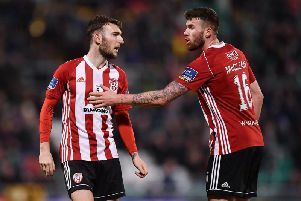 Aidy Delap comes off the bench against Harps and lights it up at 20 years of age - so let's enjoy it. "Gilchrist has just turned 24 and you would think he's older than that the way he's been playing. Eoin Toal only turned 20 a couple of weeks ago. Conor McDermott and Jamie McDonagh are playing at right back and are both in their early 20s. Nathan Gartside has been playing in goal and is 20 years of age. "We want to entertain and want players who are fresh and exciting and I think we have that. "Yes, they're going to have dips and games where it doesn't work out for them. We can talk about all the best players in the country but these are exciting players. That attacking six or seven players have been sensational in the opening period and fair play to them. "We're trying to build but at the same time we want to entertain. We don't know where it's going. They're great people to work with and we all know we have to get better. At this moment of time they're a credit to themselves."